Can A Big Earthquake Trigger Another One? A new scientific report claims that a powerful quake can, in effect, be contagious. The finding could have important implications for hazard planning in earthquake zones. 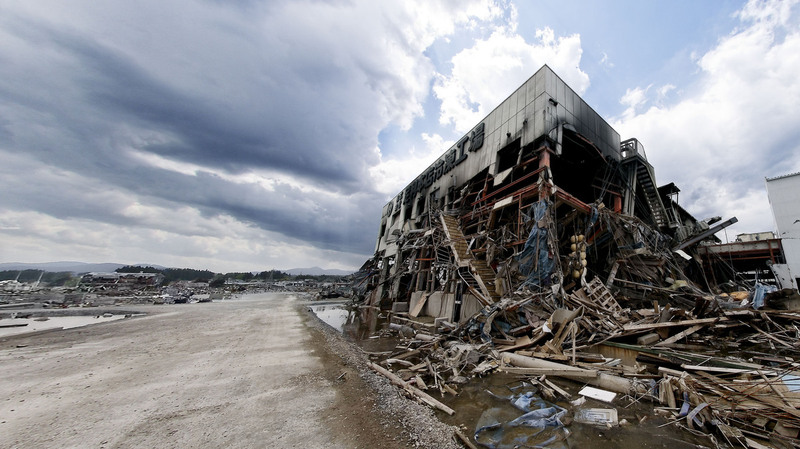 Kesennuma, in the Tohoku region of Japan, was devastated in a March 11, 2011, earthquake and tsunami. A researcher studying recent mega-quakes says this one, centered some 300 miles from Tokyo, could actually mean an increased risk of a quake hitting Japan's capital, one of the most populous metropolitan areas in the world. There's a joke among scientists: Prediction is difficult, especially about the future. For Ross Stein, it wasn't a joke after the Indian Ocean quake and tsunami in 2004. It killed some 275,000 people. "I just felt almost a sense of shame," Stein says, "that this tragedy could have been so immense in a world where we have so much intense research effort." Stein's a geophysicist at the U.S. Geological Survey. He says quake experts have learned a couple of important things over the past few years. They've learned from big quakes in China, Chile, Japan and New Zealand, as well as the Indian Ocean quake. The first new idea is about aftershocks that follow a big earthquake. They're not just a sort of quake death spasm; they can actually make more quakes more likely. Take for example two recent quakes — one off the coast of Chile, and the Japanese Tohoku quake. "Even though these megaquakes in 2010 and 2011 were enormously damaging," says Stein, "in airline parlance they were still near-misses." They hit about 300 miles from Santiago and Tokyo, and that's lucky. You'd think they'd dodged a bullet. But Stein says new research indicates they may be in more danger now. That's because those quakes and aftershocks actually exported stress to other faults, faults close to Santiago and Tokyo. And that's bad. More stress could make them slip and cause another big quake near those cities. Says Stein: "So in the greater Tokyo area, the hazard is probably two to three times higher than it was before the 2011 main shock." Now, there is some good news here as well. Stein says the pattern and frequency of a mega-quake's aftershocks should give scientists a way to roughly calculate the chance of another subsequent quake — in fact, with more certainty than they can predict an initial quake. So that's one lesson learned. Here's another. In Japan, it was a tectonic plate boundary out in the ocean that caused the quake and tsunami. Scientists had been watching it, and they knew it could go sometime. But they figured if it did, only one section at a time would rupture, kind of like a button or two on a shirt popping. They were wrong. It unzipped. "What happened in Tohoku is the whole thing ruptured and created a much larger earthquake than had previously been anticipated," says Ned Field, a geophysicist with the USGS. Field says geoscientists now view some fault systems as closely tied together; when one part ruptures, others follow. "We're recognizing that rather than having these isolated magnitude 7-ish type earthquakes," he says, "on occasion these faults can link up into much larger earthquakes." So, in effect, what scientists are learning is that a big quake can be contagious, either right away, or over a period of months or years. This has implications. Field is rewriting the earthquake hazard plan for California, due out by the end of the year. The new version will incorporate the idea that if a quake hits nearby, chances of another one go up. "That may be a basis for going out and getting more earthquake insurance for the next year," he says, since your risk will rise. Or it might induce you to do a little home reinforcement to make your house more resilient. Stein, who describes the latest quake research in the journal Science, says geoscientists now have more to offer the public. "We owe them our best effort at depicting where the hazard is high," he says, "so people can be aware of it and make decisions."